Shaffer Chimere Smith (born on October 18, 1979 in Camden, Arkansas), better known by his stage name Ne-Yo, is a Grammy Award winning American R&B singer, producer and actor currently signed to Def Jam Records. In 2006 he released his debut album In My Own Words, which featured the hit single So Sick. The song reached #1 on the Billboard Hot 100 and helped his album debut at #1 on the Billboard 200. He has since released 2007's Grammy award winning Because of You and 2008's Year of the Gentleman, and his fourth LP, Libra Scale, was released on November 22nd, 2010. The initial single was UK #1 Beautiful Monster. Champagne Life and One In A Million followed. Ne-Yo was a beautiful song writer before he became a recording artist. He has written songs for a number of artists, including Mary J. Blige, Ruben Studdard, Marques Houston, Faith Evans, Christina Milian, B2K, Nivea, Tyrese, Jamie Foxx , Heather Headley,and Mario . After coming off a bad deal with Columbia Records, Ne-Yo originally decided to remain as a songwriter until a close friend introduced him to L.A. Reid who signed him to Def Jam Records on the spot. The origin of the name Ne-Yo was given by a mutual friend in 1999 who called him Neo because he could 'see' music akin to the character Neo from The Matrix trilogy. He altered the '-yo' part as an homage to his hip hop roots. Ne-Yo's debut album, In My Own Words, was released in early 2006, through Def Jam Recordings, and debuted at number one on Billboard 200, selling over 301,000 copies in the first week and certified platinum. During the same week, Ne-Yo's second single "So Sick" (produced by Stargate) reached number one on the Billboard Hot 100 chart. Ne-Yo is as famous for his songwriting as for his singing, writing such songs as Rihanna's top ten hit "Unfaithful", Mario's "Let Me Love You", Mario Vazquez's "Gallery", Paula DeAnda's "Walk Away (Remember Me)", and Beyoncé's Billboard Hot 100 ten-week number-one hit "Irreplaceable". His second album, Because of You, was released May 1, 2007. The first single from the platinum-selling album was "Because of You". He has also said that he has written songs for Whitney Houston, Celine Dion, Britney Spears, Corbin Bleu, and Enrique Iglesias for their upcoming albums. Smith also has stated that he will write songs for Craig David, Usher, Chris Brown, Jennifer Hudson, Leona Lewis, and he recently confirmed that he has been contacted by producer will.i.am to work on Michael Jackson's upcoming album. Ne-Yo opened a recording studio called Carrington House and started his own label, Compound Entertainment, in 2007; Paula Campbell, Sixx John, and Shanell are now associated with Compound. In December 2007, Ne-Yo and the Goo Goo Dolls performed at a fundraising concert for presidential candidate Sen. Barack Obama. He appeared in the song "Deewangi Deewangi" in the Hindi movie Om Shanti Om. In February 2008 at the 50th Annual Grammy Awards, Ne-Yo won Best Contemporary R&B Album for Because Of You. 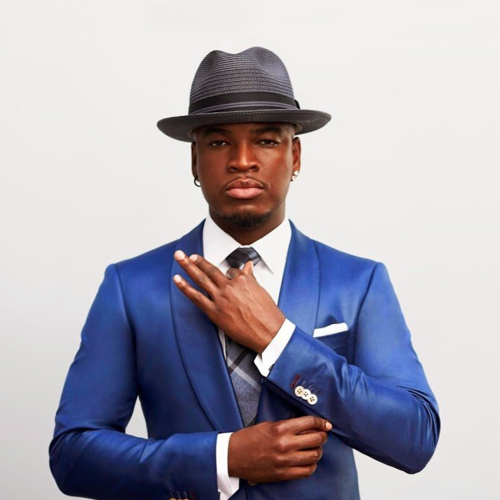 The Lazy Love Songfacts reports that Ne-Yo's fifth studio album was originally titled 'The Cracks in Mr. Perfect' before Ne-Yo changed it to R.E.D, which stands for "Realising Every Dream".